The Masai dance that is repeatedly seen in African documentaries is usually called the "jumping dance". This particular dance is performed by the men of the village, who leap into the air to show their strength and stamina as tribal warriors. Each young man will jump as high as he can while the others stand in a circle and sing. The voices of the men get higher as the jumping increases. This jumping dance is as familiar to the Western world as the red-clad and beaded Masai warriors themselves. In the Masai language, this dancing competition is called the "adumu". 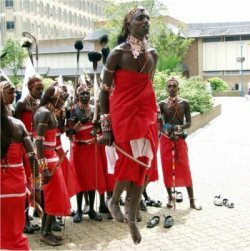 Though the jumping dance is the most unusual and best known, there are plenty of other traditional dances that the Masai perform. Masai dances are very structured and are performed for certain occasions. There are dances for celebration when a lion is killed by the warriors, a dance for the blessing of cattle, and dances performed at wedding ceremonies. Most of the Masai dances are pretty simple, and consist of a lot of bending, but with the feet staying still on the ground. The Masai generally don't use musical instruments when they are singing or dancing. All of their music is vocal, except for a large horn that is used for certain songs. The beads that both the men and women wear create a jingling sound themselves while the Masai jump and dance. The women occasionally wear bells or rattles for added accompaniment to the singing. During singing and dancing performances, the movements of the head and neck are important. As the singers breathe out, the head is stuck out and then tipped farther back when they breathe in. This pattern creates a uniform "bobbing" of the Masai's heads as they sing. Kind of like teenagers at a rock concert. Many Masai songs are sung in a call and response pattern, with the women singing one part and the men responding. In recent years, the Masai have been performing their customary songs and dances for outsiders as a way of educating foreigners about their life and ways. These performances are one way of helping to keep their traditions alive as their way of life is slowly being changed by modern society. Much of their territory has been taken from them for ranchers and settlers, leaving the nomadic Masai without the space their cattle need. So they have to adapt. If you are ever lucky enough to travel to Africa, and see the Masai yourself, try to find a tour guide who is familiar with the local villages. Quite often, the people are willing to perform their dances for visiting tourists. A true Masai dance is something not to be missed. Against the roasted brown backdrop of the African plains, the bright scarlet dancers are quite a sight.